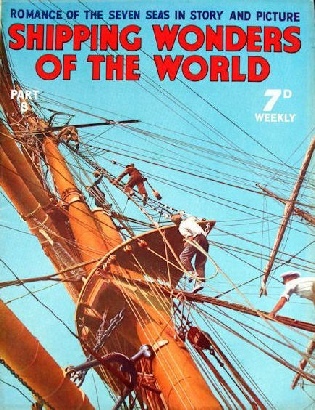 Part 8 of Shipping Wonders of the World was published on Tuesday 31st March 1936. It included a colour plate illustrating signals used on ships at night. This accompanied an article on Pilots and their Work which is listed below. The coloured plate was attached to page 252 of this issue. This week’s cover shows men going aloft on board the Archibald Russell, a sailing vessel of 2,354 gross tons, under the Finnish flag. It was later used as the c olour plate with part 33 and called “Going Aloft”. Click on the small icon to see a British Pathe newsreel clip “The Last of the Windjammers” (1931). Searching for treasure on Cocos Island. Concluded from part 7. To race with death and cheat the storm of the lives of men in stricken ships is a task nobly and bravely accomplished by the lifeboatmen. The story of the lifeboat is an extraordinarily interesting one. During 1935 there were 376 launches of British lifeboats of the Royal National Lifeboat Institution, and 492 lives were saved. Since the Institution was founded in 1824 over 64,000 lives have been saved, an average of eleven lives for every week of its 111 years of existence up to 1935. The Institution has 169 stations round the 5,000 miles of coast of the British Isles. The article is by F A Bex, and also deals with the lifeboat service of other nations. The adventures and misfortunes of the great sixteenth-century seaman, Ferdinand Magellan. He led the first voyage round the world, and his name will always stand for courage and persistence, in the face of uncharted dangers. On September 20 1519, five small vessels set sail from San Lucar, a port at the mouth of the River Guadalquivir in Southern Spain. They were led by a navigator, Ferdinand Magellan, who proposed to sail round the world on a voyage of exploration. Some 275 men sailed into unknown and uncharted seas. On September 6 1522, only eighteen of them -with four natives - returned in one ship after unimaginable adventures and hardships. Magellan was dead - killed by savages in the Philippines - but his name lived and lives on as one of the greatest sailors of all time. His was an epic of the sea, if ever there was one. This chapter was written by Sidney Howard and is the first in the series on Supreme Feats of Navigation. You can read more via this link on The First Voyage Round the World. Years of experience and ceaseless experiment, together with the ever-widening science of engineering, have made the ship’s engines the marvel that they are to-day - powerful and reliable. This chapter was written by A C Hardy. Click on the small picture to see a British Pathe newsreel clip “New Propellers for the Mauretania” (1927). 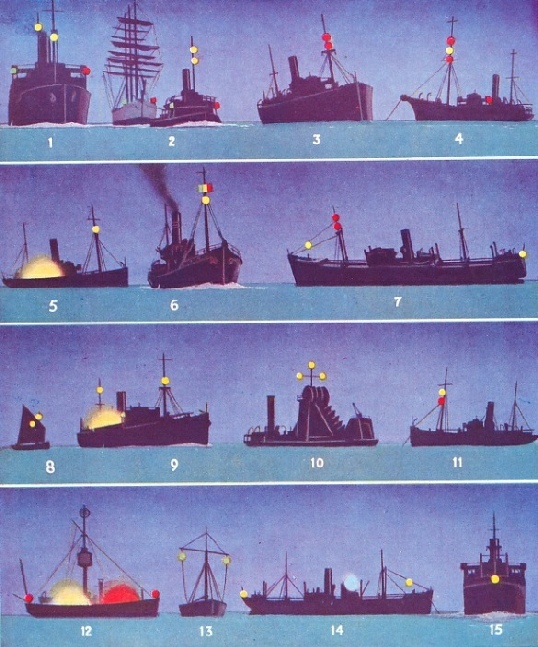 The colour plate issued with part 8 shows the various lights and flares used to indicate a variety of night signals to other vessels. A key underneath the illustration (not shown) provides a full explanation of each signal. A tragic sight and a peril to other craft, abandoned sailing ships caused such havoc in the shipping lanes that special measures were taken to rid the sea of them. This article is by Frank Bowen and is concluded in part 9. The story of navigation on the Yangtze Kiang goes back far beyond the written record. To-day as ever this great river forms a vital highway for maritime trade, but for the sailor it is a highway often fraught with danger and hazard. This chapter is by Sidney Howard and is the second article in the series on World Waterways. Click on the small image to see a British Pathe newsreel clip “Chinese Junk” showing an imported Junk sailing at Chertsey (1961).